On October 29, 2014, Tra Ly Bridge, the first cable-stayed bridge of Thai Binh Province, was started constructing. The total investment is VND 505.6 billion. – The Client: People Committee of Thai Binh City. – Design Consultant: Bridge ad Tunnel Engineering Consultant Joint Stock Company. – Construction Company: Join venture No. 473 company and Xuan Quang Company. 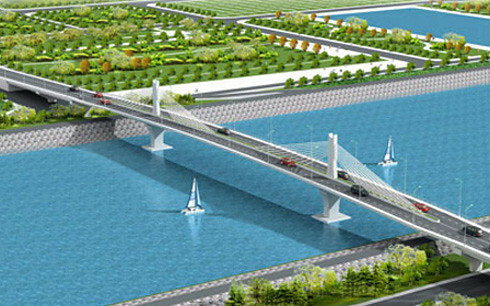 Tra Ly Bridge will connect southern ring road of Thai Binh City to Nan Cai Road (in Hoang Dieu Commune, Thai Binh City). Tra Ly Bridge is reinforced concrete and pre-stressed concrete bridge.